Former Deputy Minister Sarath Kumara Gunaratne, arrested for allegedly misappropriating Rs.12 million public funds, was ordered remanded till January 9 by Colombo Chief Magistrate Lal Bandara. 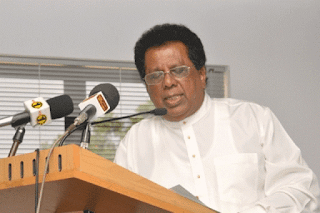 The former Deputy Minister of Fisheries was arrested by the CID for allegedly misappropriation of Rs.12 million belonging to Ceylon Fisheries Harbour Corporation (CFHC) during the last Presidential election. Defence counsel Sampath Mendis appearing for the suspect informed Court that there is no summary of evidence against the suspect and moved Court that his client be released on bail as he is suffering from diabetes. The Chief Magistrate announced that he would make an appropriate order after perusing relevant documents at the next hearing. At a previous occasion, former chairman of Ceylon Fisheries Harbours Corporation (CFHC) Upali Liyanage, CFHC General Manager Piyal Abeysekara, Deputy General Manager Chandana Palpita and Lakmuni Munidasa were ordered released on bail. In this case, the CID had named six individuals including former Deputy Minister Sarath Gunaratne as the suspects following the instructions of Attorney General. The Special Presidential Investigation Commission had recommended that the Attorney General’s advise be sought to institute necessary legal action against the persons who responsible for the alleged financial frauds. The Attorney General is expecting to file indictments against the suspects in the High Court.